DogDays will treat your dogs and cats like their own! Do you want to be able to leave your house guilt-free, knowing that your dog will be in great hands as well as not being cooped up all day? Well that’s what we’re here for! 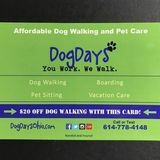 DogDays is a rapidly growing dog-walking, boarding and pet-sitting business that services the greater Columbus area, including most suburbs. Our team consists of bonded, insured, passionate pet lovers who would love to help with your pets while you’re at work, at the game or even on your family vacation! We only walk one dog at a time so that each dog we cater to gets one-on-one attention, focus and love. Heather’s Happy Paws! Ready for your fur baby now!